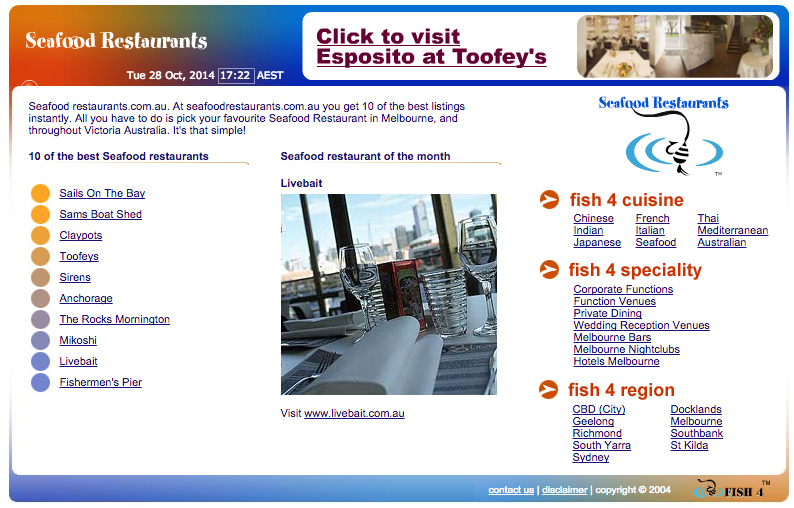 First established on the 20th June 2003, seafoodrestaurants.com.au was successfully launched on the world, wide web. "Keep in mind at this time access the internet was predominantly on personal computers, on dial up access or on desk tops in the work place. No such thing as i-phones, i-pads or mobile devices back then. Flash was also all the rage & screen sizes for the mass population were 790 x 500 pixels." Search engines were more like directories & were limited in their accuracy, with Yahoo, Looksmart, MSN & DMOZ.org the main providers. Google as we know today was born from DMOZ – the OPEN DIRECTORY PROJECT. 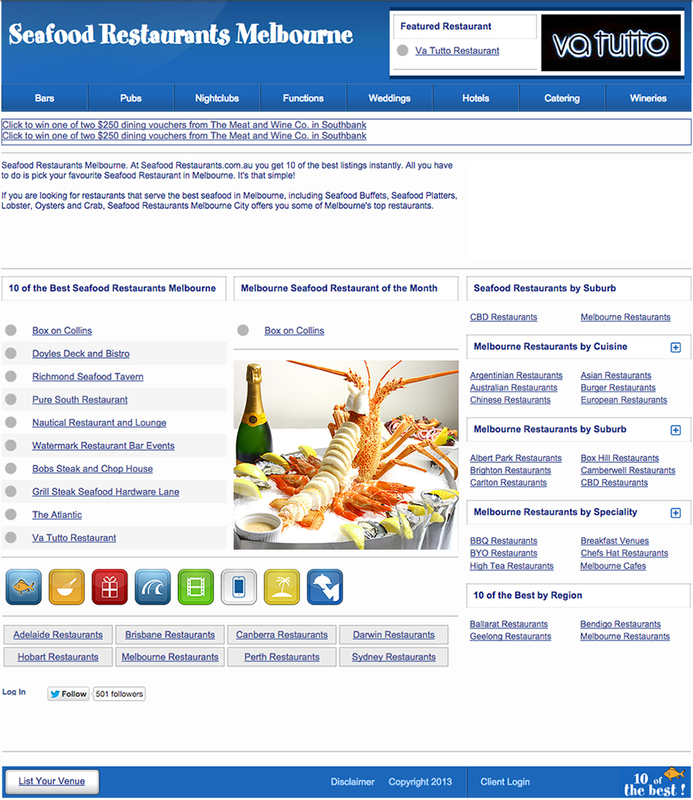 Seafoodrestaurants.com.au was an exciting new restaurant directory that gave the online foodie an informed choice to 10 of the best seafood restaurant listings in Melbourne, instantly. Our selections were based upon a wide range of dining criteria. Diner feedback, hospitality market place perceptions, contributions to their particular cuisine, field of endeavor, online positioning of restaurant or venue, peer group recommendations, and above all the venues commitment to quality & service. 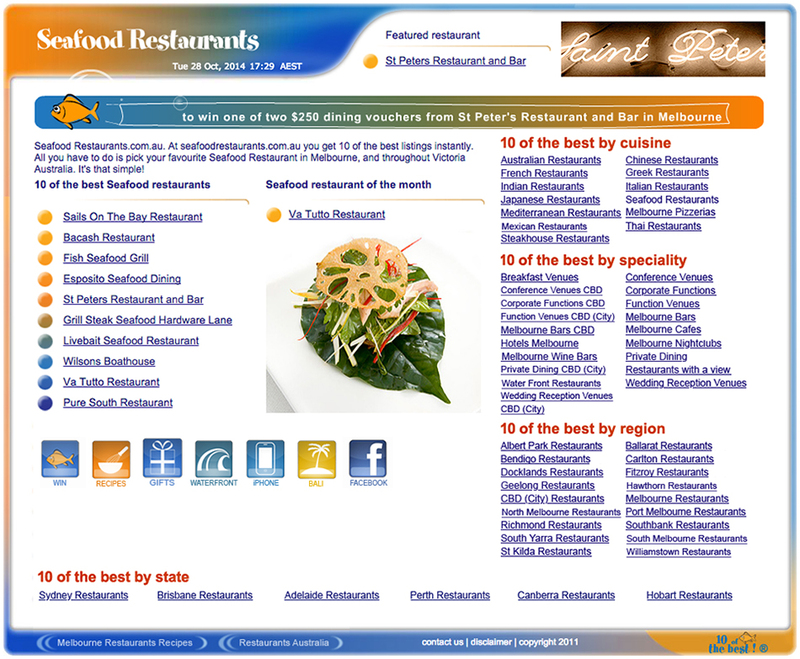 Seafood Restaurants was designed to offer the dining consumer a quality and unbiased search result, allowing them access to the best seafood restaurant listings, quicker and more responsively. Consumer feedback was provided by, simply clicking on the "Contact Us" button, and leaving a venue recommendation. 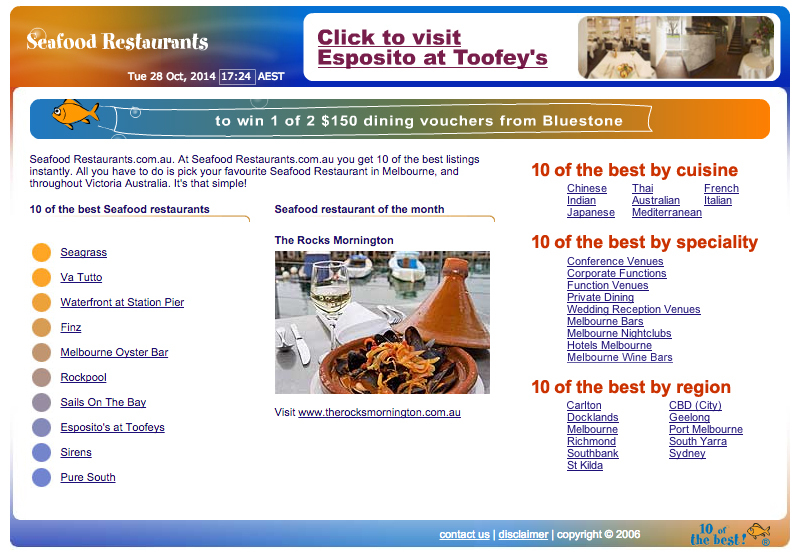 "Enjoy the Seafood Restaurants" 10 of the best! Evolution.